Pet anxiety has been part of my life for many, many years. I began my dog training career working in an animal shelter, and it just broke my heart to see all the dogs and cats suffering and stressed with their new situation. Little did I know at that time, helping dog and cat parents with their anxious pets would be the foundation of my career in the pet industry. I’ve spent the last 20 years learning new ways to help my clients and their fearful dogs and cats. Whether I’m learning new behavior and training protocols, discovering how food can affect behavior, or researching new pet products for anxiety, easing a pet’s anxiety is always in the front of my mind. CBD for dogs, cats, and other pets has been receiving some good press. Various ongoing scientific and clinical studies are being conducted on the use of CBD for various medical and behavioral issues. Dr. Robert J Silver, a holistic veterinarian, wrote the book Cannabis For Pets, which discusses the many potential clinical applications for this herbal drug therapy. I have been listening with open ears over the years, as other pet experts discuss CBD for pets, particularly how it can help scared dogs and cats. Over the last year, one brand came onto my radar, Treatibles. As luck would have it, they were at a pet blogging conference I attended last month, so I was able to speak with them in-depth about their CBD products for pets. 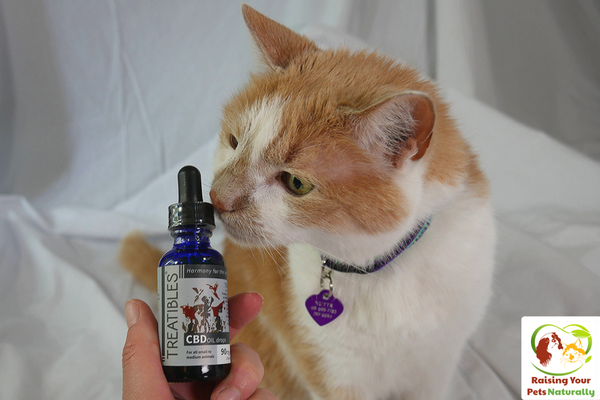 After our conversation, we decided I would review and try their CBD oil drops for pets. At the moment, I do not have a dog with anxiety, but I did have a client that was willing to try Treatible’s CBD oil drops with her dog, Sora. I’ve been working with my client and Sora for two years. They are doing great! 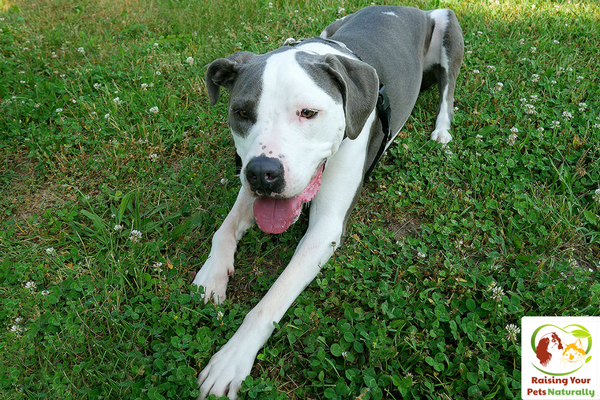 However, Sora is a fearful dog who has been working hard at overcoming his dog anxiety. He also gets worked up and rowdy quickly around various stimuli. I felt he would be a perfect candidate for Treatible’s CBD oil. Unlike some anxiety medications or natural calming aids, the effects are pretty immediate, typically five minutes to an hour after the first dose. Treatibles are safe and non-toxic, and can be administered as needed, depending on the pet’s behavior. If a pet guardian does not see a difference within the hour, another dose can be given. During the first few times of providing CBD oil to your pet, observe him carefully to find the optimal dose. You cannot overdose on Treatible’s CBD oil. Sora started taking his CBD oil two times a day. After day two, I asked how Sora was doing now that he was using Treatible’s CBD oil. His owner was thrilled with the results! She told me he was far calmer around his high-arousal triggers and a lot easier to redirect if he did get a bit focused. She also told me he was disengaging in caring about the triggers quicker. She also said that his low-arousal triggers were almost nonexistent. He was even lying around during some mild stimuli, instead of being focused on what was going on and trying to decide if he should be concerned. I asked her if he was lethargic or had less energy than usual, and she told me no. He seemed more relaxed and able to sleep when the time was appropriate, but was ready to play and engage with her easily. You may have noticed the title of this blog post also mentioned pain management. As some of you may already know, my dog Dexter suffers from Chiari-like malformation (CM) and syringomyelia (SM). His disease causes some days to be more painful than others. I’m a member of a few CM/SM groups where pain management is often discussed. In our discussions CBD oil often comes up as a recommendation for some dogs. It’s never 100% successful with each dog, but some find it useful in managing syringomyelia pain. I’m happy to report that I have not had the chance to test this on Dexter, as he’s been pain-free for quite a while! But I do have it on the ready for the next time he has a painful day. People may wonder why I choose to review the Treatible brand. Two words: manufacturing and testing. Treatibles are non-GMO, and the hemp used is grown in Colorado. Each batch goes through three levels of testing, and is third-party tested to boot. They test for heavy metals and contaminants in the cannabinoid materials, and cannabinoid levels in the raw material and in the final product. Test results can be found on their website. What’s next in my review? A read-through of the ingredient panel for my viewers. 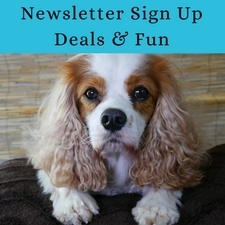 This part is always an important factor when choosing a pet product. What, exactly, are ALL the ingredients? I’m definitely adding Treatible’s CBD oil to my toolbox of tricks. From my research and the results so far, I think this is a great product for pets with anxiety, particularly if they are active because of the anxiety. 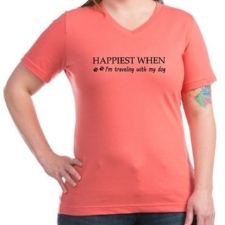 For example, separation anxiety, dogs afraid of storms, fear of fireworks, travel anxiety, etc. I’m also hopeful that it will help Dexter the next time he has a painful episode. I truly want to thank the team at Treatibles for bringing such a great product to market, and for their integrity with their product’s manufacturing and ingredients. 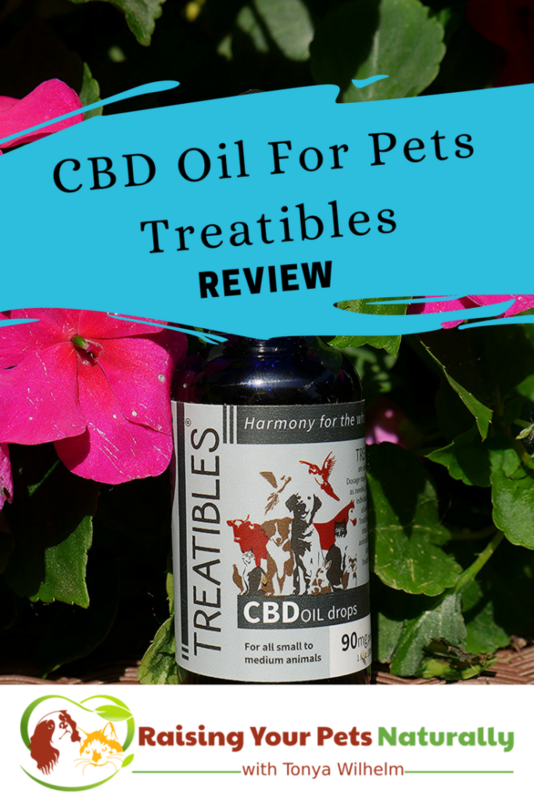 If you have a pet with anxiety or pain, I urge you to click and read more about Treatible’s CBD oil for pets. 2/26/18 UPDATE: My client now has all three of her dogs on Treatibles and continues to see success! 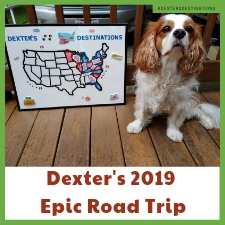 Dexter is now taking Treatibles 2 x day per his vet. You can read about it here. Do you have an anxious pet? Tell me in the comments. I’ve been trying to learn about some of these new CBD products for pets, especially with pain management. We’ve been approached by another brand to give it a try, but I’ve been hesitant. Thanks, Nichole. Treatibles is an amazing brand and the quality of ingredients is fantastic. As you know, I’ve very particular on what I allow Dexter to have. 100% confident in this brand. I had never heard of this product before. Luckily none of my five pets have any issues at the moment. Thanks, Heather. So glad all 5 pets are doing great! That’s awesome. That’s very interesting. You hear about oils for humans, but it never occurred to me pets could benefit from them too! I love seeing more and more non-gmo products out there, whether they’re for humans or animals. I hope the trend continues. Thanks, Denise. I totally agree! We need to continue to support brands that offer great products, including their ingredient selection. I need to check this out! It’s so hard to find real natural ways to help relieve your pet’s anxiety. I’m glad you shared this! Glad to help Gloria. Feel free to search my blog on pet anxiety, I have a variety of articles on the topic. My pup has some major separation anxiety so I may have to give this a go! Sounds like a truly great product. I’m excited for the future research in this area. CBD oil’s certainly have a benefit in people, so it makes perfect sense that they would for our pets as well. Thank you for being willing to test this product out and share! Thanks, Jessica. Absolutely. I’m always trying to improve Dexter’s quality of life and my client’s too! This is a fantastic read. More often parents must educate themselves on these. i should look into this. thank you! I have always wanted a dog. Now more than ever. Thanks for the info! glad this is giving your dog some comfort. I never heard of this product before. I have a calico with serious anxiety disorder. I wish I could use this on her, but it’s actually illegal in Florida – unless you are on a registration list. I do know the difference between marijuana and CBD. Apparently, Florida wants to regulate this to death. Alicia, this product is legal in all states. ! I’m so stoked that you did this post!!! I’ve been so curious about CBD and/or marijuana for pets. My dog has the worst anxiety, especially when I leave the house. I might have to give this a go. I love the idea of products that can be safely used on our furry little friends. Have you seen the hair dye you can use on pets? I have only seen photos online. I would really check the ingredient label on something like that. This is cool, I never thought there were oils that are good for puppies! I love dogs and I owned one before, but when I use oils or sprays, I remember how she would constantly lick it away haha. But that’s an interesting fact I just learned how oils are used for pain management. Yes, this is CBD oil, which is ingested, not topical, so no licking. I had no idea animals could have anxiety but it does make since. My dog, on the other hand, is scared of everything and I mean everything by anything he has never seen before. Not sure it’s anxiety though maybe just a boston terrier thing. Poor guy. It’s most definitely anxiety, not a Boston thing. It’s never good to live in fear. You can search my website for tips. I also offer phone/Skype sessions. I have been hearing about all the great benefits there are with CBD. I did not know you could get it in treats for your pets. It would be great for my pups arthritis. Hi, Claudia. Yes. Treatibles are good for arthritis. They make a treat form or just the oil, like I used. Used to have a Chihuahua with all types of anxiety. Would’ve loved to have known about this then. Shared on FB. Sorry about your Chihuahua. I hear you. My previous dog was riddled with anxiety, this would have helped him a lot! Thanks for sharing. Thanks! Yes, we want them to be as happy and pain-free as possible. Hi, I never heard of pet anxiety before, but thank you for sharing this post. I actually learned something new today and i am glad. I want to get a small puppy for my daughter and it is good to be aware of these things! Thank you. Being calm and content is so important to the quality of both our pet’s lives and ours. Honestly, I’m always so happy when people tell me their pets are stress-free! 🙂 Yup, no overdosing on Treatibles CBD oil. hahaha Sora is a looker. I’ll tell his mom. Pet anxiety is the major part of my work. It’s sad. But I’m so thankful when I’m able to help a pet parent tackle such a condition. this is a new one to me, i love pets, dogs especially and never thought of this as a good help, truthfully this is a good help for the effect , will be sharing to friends and family who have dogs as i dont have one now. Thanks for sharing. There are so many pets with severe anxiety. Our dog gets very anxious during storms, so much so we have to sit with him until he falls asleep. I will look into this, after last nights storm I’m starting to get worried about him. So sorry, Nicole. My previous golden had severe thunder phobia. You can search my blog for some other ideas. I would certainly add Treatibles CBD oil. Over the years, I’ve learned to keep a variety of natural remedies on hand. You never know when you may need something. Hope your move went well. I will have to try out some of that oil with my dog. I’ll let you know how it all turns out once I do. Thanks, David. I would appreciate that. I always like to hear feedback. We don’t really think of animals as having anxiety, but they are quite similar to us! CBD Oil sounds like a good remedy. 🙂 Even the smallest creatures can have anxiety and emotions. That’s awesome news~! Happy and healthy is always preferred. I use this cbd oil on 2 dogs for 2 different reason. The older has arthritis–and this has made a major difference in her life. The other is pre-seizure. Loud noises (year long fireworks) make him almost catatonic. This oil has been a major blessing. I also have the cookies and they each get one in the morning—I will NEVER be without! Thanks for the feedback Bonnie! I am so glad it’s helping. I so wish Treatibles were around when I had my thunder, fireworks, noise phobic dog. hmmmm…. interesting. Wondering if it’s safe for flying. Vets really don’t like to sedate pets for flying since it can cause more harm than do good. I don’t see why not. They are not lethargic or lose any body movement. No “loopy” etc behavior. The company is amazing, shoot them an email. I’m definitely looking into this! My cat has no issues, but I’m fostering two dogs with a lot of anxiety. Thanks for this! Thanks for fostering! That’s such an important role. <3 You can also search my blog for "anxiety" for more tips. Thanks for introducing me to Treatible’s CBD oil. I’d never heard of it before, but our dog does suffer from mild anxiety. And considering he’s 15-years-old, he does have a bit of pain that may be managed with this. I’ll have to look into it more. Thanks, Rachel. Sorry to hear about your dog. 15, that’s amazing! Mr. N has SA and I’ve been thinking about trying something along these lines. Maybe for the plane too. Great review! I love seeing unbiased reviews on products BEFORE I spend money trying them! This is great! Thanks, Shayla. I appreciate your words. I know how pet parents are looking for the best and something that helps. I will never lead a reader astray. I used to have a dog that was afraid of storms. How I wish I had this when I had that dog. Sadly she passed a few years ago. This product definitely would have helped her. If we get a dog that has anxiety, I will keep this product in mind. Hi, Jessica. Sorry about your previous dog. That was my Theo too. I have 4 dogs although I must admit that I’m not yet that well-versed with pet anxiety and its treatment. This is a great resource. As a pet owner, I’m always curious to learn about products on the market that help make their lives comfortable. This was very insightful and informative. I’m with you. I try to arm myself with as much knowledge about pet behavior and products I possibly can. The more in my toolbox, the better. This is interesting. I didn’t know these products existed. Thank you for blogging about it. I don’t think I’d be overly comfortable using CBD for anxiety and other “minor” issues. I would, hovewer, consider using it for any serious problem it could work for if other options ineffective. Will have to share with pet owners I know. I don’t have an animal otherwise would try this product out! Thanks. Thank, you for sharing. 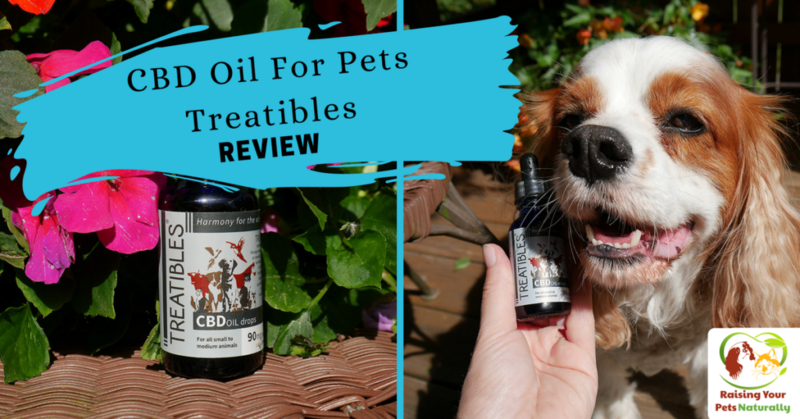 With all the pet lovers out there and all the anxiety and pain, I’m happy to have Treatible’s CBD oil shared. You never know who it may help. I have not noticed any anxiety in my dog but I would be more observant. I am glad there are products like these available to help our fur babies. I’ll share the info with my sister too. She’s got 3 dogs. Hi Annemarie. I’m always so happy to hear that someone’s pet is anxiety and pain-free. Love it! Thanks for sharing. Wow! I am glad this is already available for our pets too. 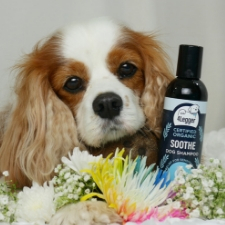 I am sure this will be a big help for our pets who are undergoing some anxiety issues. Thanks, Anosa. 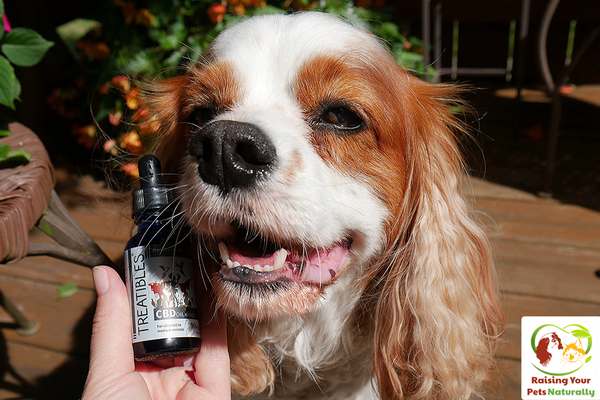 I’m so happy to now have Treatible’s CBD oil in my bag of tricks for anxious pets or pain management. I only found out recently that pets can get anxiety. Glad there is a product such as CBD oil to help the fur babies. Unfortunately, there are a lot of pets suffering from anxiety. It’s actually a big part of my behavior services. 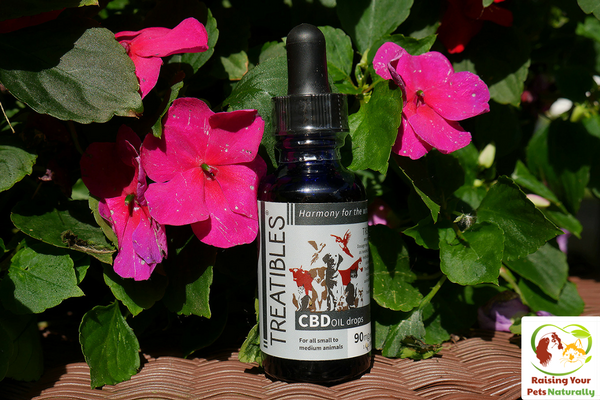 Treatibles CBD oil is a great addition to my toolbox. This sounds really interesting and I would like to give it a try with Ruby. She does have some separation anxiety and nervousness around other dogs and new people. What about side effects with prescription meds? Obviously I will talk to my vet, but curious if that was discussed during your interview? Ruby is on a low dose of Phenobarbital for seizures. Thanks, Ana. So very true. And we think of our pets as helping our mental health, it’s important to make sure theirs is met too. This is great. Every year, I try to do my best to keep my cats and dogs anxiety level low when 4th of July comes around. They are terrified of the fireworks. Good to know there are some preparations we can purchase to help them calm down. Sweet kitties. Yes, I have high hopes for Treatible’s CBD oil for this year’s fireworks! Wonderful! I use CBD oil on my massage patients that have pain associated with stiffness, arthritis, or more. Treatibles is a wonderful company and Beau is also benefitting from their chews. Wow, that is a really short period of time to see results! One of my friend’s dogs is very fearful, I’ll have to let her know about this. I know! I am so glad to be able to have this in my toolbox when working with clients. Never any silver bullets, but a great help! That’s awesome that Treatibles worked so well for your client’s dog and his anxiety. Our boy Ringo can be anxious at times, though it’s 500x better than it used to be. It may be worth looking into for those unexpected situations that are way over his threshold though. Thanks for sharing! So glad that Ringo is doing so well. I wish Treatibles were around when I had my extreme golden, Theo. I would definitely recommend trying it with Ringo. This definitely looks like a good product, I like that it’s all natural. It’s wonderful that it’s worked so well for Sora! Thanks for sharing. Thanks. Yes, they are becoming popular. However, not all brands are actually testing the quality of the ingredients or even know that you can’t heat it over x degrees or it is ineffective. As always, researching a brand is key. I really regret not talking to the Treatibles folks more at BlogPaws. We got a few samples and we really find that Felix is a lot more chill with them and he seems less stiff. He also thinks they’re the bees knees and will bark to ask for one, so that’s always a bonus in my book. The catch? I can’t find them in Canada. WHOMP WHOMP. I’m hopeful I can track some down! I may have missed this in the discussion, but does one need to give this every day or can it be used in specific anxiety situations, such as thunderstorms and fireworks? I ask because my mom’s dog has a fit with storms! Keeping a pet seems to be a tough job. But you’re doing a great work on helping people to raise pets in healthy ways. Thanks. It can be. But, they give back so much more. Amazing! I’ll have to try this on my dog! He gets terrible anxiety whenever we have to put him in our car! Poor guy. I think this would be great for car anxiety. I plan on recommending it to clients dealing with this. 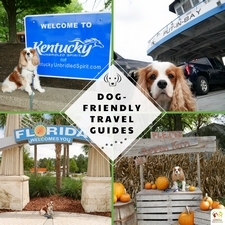 You can also search my blog for travel anxiety for some other tips. Hi, Rida. So sorry to hear about your kitty. Maybe give Treatibles CBD oil a try. You can also search my blog for anxiety for some other tips. I had no idea it works for animals as well! We’re all made of the same stuff after all, huh? My next door neighbor’s lab has severe thunder phobia. I hate seeing that sweet dog suffer. Here, in Florida, we get a thunderstorm almost every afternoon. I am going to purchase Treatibles CBD Oil for them. Hopefully, they will give it a try! That’s an interesting product. Something to try. This sounds amazing! Thank you!! Sure thing. It’s good stuff! Wow! I think I’m going to try this product. Unfortunately last year we started to have problems with our male Bouiver, Hemi, and fireworks. For some reason (after 6 years). I found him cowering in the bushes. This is an interesting product. I’d love to see studies on this. I am searching this type amazing product. Thanks for share. Sure thing. Anything to help pets and their families. When treating a dog with this product that has a very, very bad case of thunder phobia, do you give the product only when it is storming or is it given daily? Hi, Vanessa. It would depend on the dog’s behavior. If he as other anxieties, stress, then it can be a daily treatment. If I had this with my previous thunder phobic dog, it would be a daily for him, then re-dose about 60 minutes prior to the storm. I do offer phone sessions and have a lot of thunder storm experience if you need help. I have a cat with what is possibly idiopathic bladder inflammation. I am just beside myself with trying to find a way to help. After several bouts with blockages, catheters, changing foods, buying a water fountain, and finally having the perineal urethrostomy surgery, and thousands of dollars in debt, he has been back to the vet twice since the surgery for what was either UTI or it’s idiopathic due to stress. Both of those visits were inconclusive because they couldn’t get a specimen to determine if there was infection or not. He is very high strung and territorial, so he is starting to really be affected by the visits to the vet. It seems to be affecting his whole demeanor now. He is losing his playfulness and just seems like he’s always tense, like he’s anticipating having to go again. I just want something to help him relax, as I’m concerned that his anxiety to begin with may have been causing his bladder inflammation and now the anxiety is even worse due to all of the treatment, surgery and vet visits. I am scared that after all I have done, have I put him through all of that to just cause him more anxiety and he will still continue to suffer with these flare ups because he’s so stressed. Do you think this situation is something that may be helped with this product? Your advise is greatly appreciated. I’m at the end of my rope financially and I don’t want to lose my baby, but I can’t let him suffer like this for the rest of his life if anxiety is going to cause these flare ups every time we turn around. I have a 1.5 year old male pug who gets overly excited when we go anywhere or sees anything. It’s usually worse when we are going somewhere in the car vs coming home, im guessing because he is to tired to react and just wants to sleep… when we are on walks he goes after leaves, other people/dogs. Doesn’t matter if there are right in front of us or on the other side of the street. My pug is very social and i love that about him. But i would like him to be more calm in the car at any time and on walks. Would CBD help this behavior?? Love to read all of Tonya’s information. She is fantastic. Sure wish I lived closer. Thank you for all your help. <3 Oh, thank you! You are very kind.